What does it take for schools to equip a child in today’s world to excel in every area? How do you prepare your child for success in education, business, and their community? And how can Montessori help with this goal? The answer may very well lie in one word: Innovation. And according to the Harvard Business Review, the Montessori method is exceptional at preparing children to be innovative, successful leaders. Here’s a closer look at how Montessori breeds innovation. True innovation is more than simply creating something. It is the practice of seeing something in a new way—leading to the creation and application of new and better solutions to existing problems. Innovative thinkers don’t simply notice a problem and offer a solution. They look for ways to create solutions that have never existed before, or opportunities to blend separate ideas together in a novel approach. Many of the items we use today without even thinking about it—such as the Internet and smartphone technology—were innovative in their time. They had never been seen before, but now they solve many needs for connectivity and easy access to information that make life better. How Can Your Child Benefit from Being an Innovative Thinker? More than ever in today’s fast-moving world, the influence of people who are truly innovative is clear. Cutting-edge businesses, new technologies, and fresh approaches to societal issues are driven by innovative thinkers who can see challenges in new ways and develop creative solutions. Those who are dedicated to the idea of lifelong learning—a major element of the Montessori approach—are more likely to stay up-to-date on what is happening in the world, and are also more likely to search out and develop new skills that enable them to thrive in an ever-changing business landscape. Teaching your child to be an innovative thinker can help them be better problem-solvers, which can equip them to handle relationships and work obligations more successfully—giving them needed tools to excel in life. Well-known, successful individuals such as Larry Page and Sergei Brin (the founders of Google), Jeff Bezos (CEO of Amazon), Grammy Award-winning artist Taylor Swift, author Helen Keller, and management guru Peter Drucker are all accomplished, prominent innovators in their spheres of influence. And they also share one other important trait in common—they all received an education at Montessori schools. It’s no coincidence that there is a correlation between successful innovators and Montessori education. The Montessori approach teaches children not just to learn facts and do well on tests, but also to develop creative, innovative thinking skills that prepare them for their future. In the Montessori classroom, children are encouraged to discover how the world works through manipulating physical materials and engaging in experiential activities. Rather than simply reading a book on plant growth, for example, your child might test different types of soil in different locations that receive different amounts of water and sunlight to see how these real-world elements affect plant growth. Learning through discovery helps a child to learn concepts through real, concrete objects they can touch and see for themselves. But more importantly, it teaches children that testing ideas, failing, and then refining the ideas is a powerful way to learn and grow. Montessori helps children realize they don’t have to fear failure. If that idea sounds familiar, it should. Testing, failing, refining, and testing again is the process all scientists follow as they do research that can potentially help solve the problems we face. It’s also reminiscent of the “fail fast, fail forward” mentality that characterizes successful Silicon Valley firms and other innovative startups. It provides children with multiple opportunities each day to interact with others who are older or younger than them, fostering social skills and a sense of teamwork and community. It encourages children to view the classroom—and later their work environments—as places to both learn new skills and also share their knowledge with others. Social skills help your child later in life by equipping them with the ability to network, cooperate, and form effective teams. This is important because innovation doesn’t often happen in isolation. Rather, the discoveries that drive business growth and new technologies such as self-driving cars come about as creative thinkers work together to build something unique. Another area where Montessori is especially powerful at developing innovative thinkers is through its dedication to self-directed learning. In the Montessori classroom, rather than a single teacher at the front of the class dictating how the day will go, children are empowered to explore many different activities at their own speed. This doesn’t mean that they don’t learn academics. Far from it. In fact, many Montessori students credit the academic successes they have later in life to their early childhood Montessori education. But it does mean that children are encouraged to pursue ideas and discoveries that they’re intrigued by and passionate about. Self-directed learning builds a sense of confidence and focus in a child—teaching them that it is valuable to pursue new knowledge and create new things. It’s the attitude by creations such as the Apple computer, Google’s search engine, and Amazon’s “From A to Z” online shopping experience, to name a few. At Primary Montessori Day School, our teachers are certified and trained in authentic Montessori techniques, and your child is cared for in a nurturing environment where they are encouraged to be innovative, kind, disciplined, and confident. We’d love for you to see in person the advantage that a Montessori education can offer your child. We even offer Extended Care Hours to fit with your active schedule. 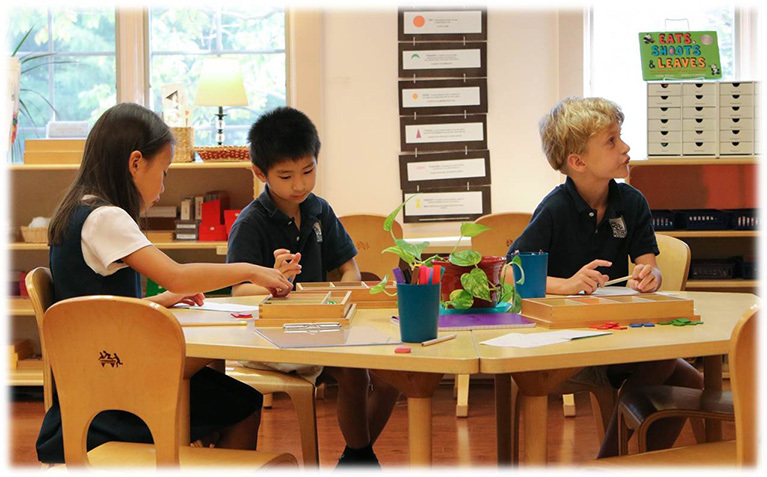 Contact us to schedule a tour and discover how Montessori can equip your child for a successful future.